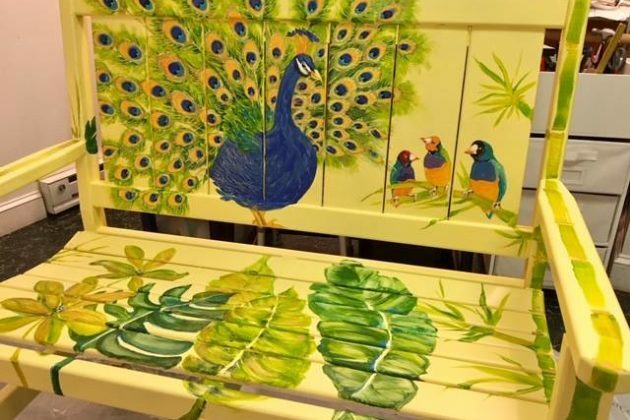 The colorful, painted benches that recently popped up outside local businesses in the Town of Vienna are marking the 50th anniversary of the Vienna Arts Society. Purcellville’s painted wine barrel community arts project in 2016 inspired the idea for the “Take a Seat Vienna” public art display, Lu Cousins, the director of the Vienna Arts Society, told Tysons Reporter. 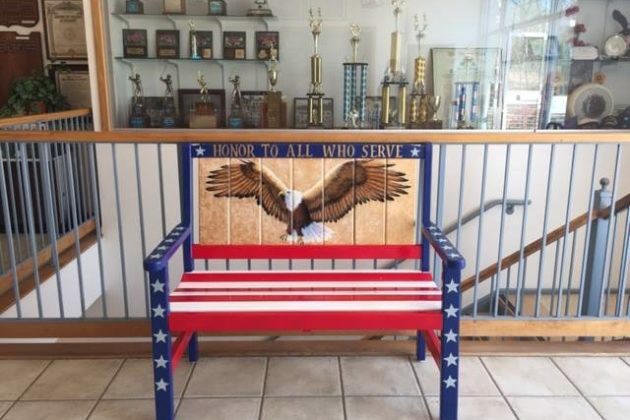 Local businesses sponsored the cost of the Amish-built benches, which each had a roughly $240 price tag, in exchange for having them sit in front of their businesses through October, Cousins said. 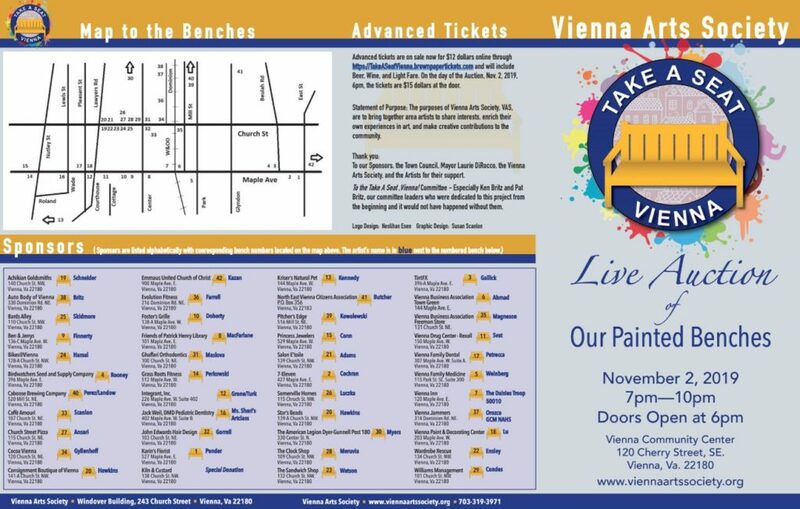 Volunteers delivered the benches to the 42 artists, 20 of whom are from the greater Vienna area. 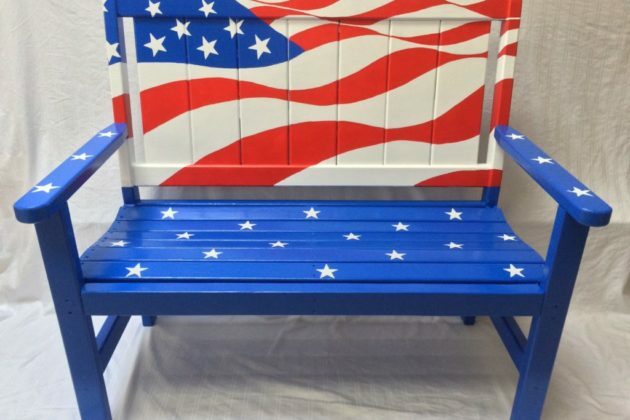 “Painting a wooden, slatted bench is completely different from painting an image on a canvas,” Cousins said, adding that the shape and angles of a bench can be tricky to paint. In addition to the artists, Cousins gave a shoutout to the team of nonartists who helped facilitate transportation of the benches and get permits from the town. Before their unveiling last weekend, the benches were varnished to help them withstand the weather, she said. 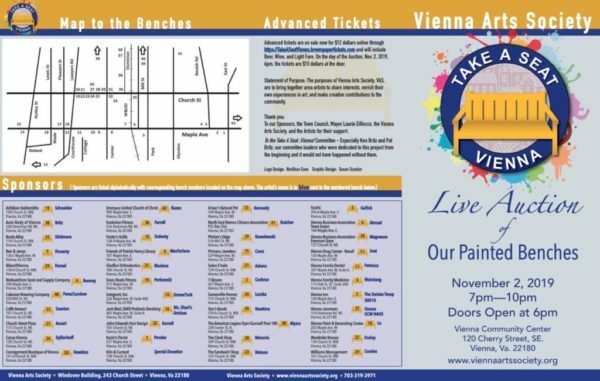 The Vienna Arts Society has a map for people who want to take a seat in — or a photo of — all 42 benches. 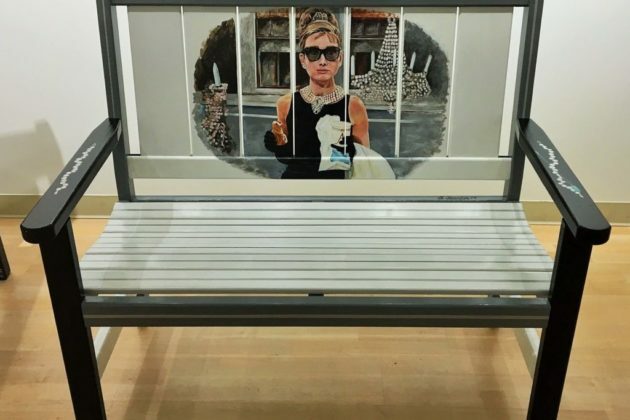 “They are spectacular works of art,” Cousins said, adding that her personal favorites include Susan Scanlon’s “Simply Dreaming” bench, which features actress Audrey Hepburn in her iconic “Breakfast at Tiffany’s” role, and the ones with ocean imagery. 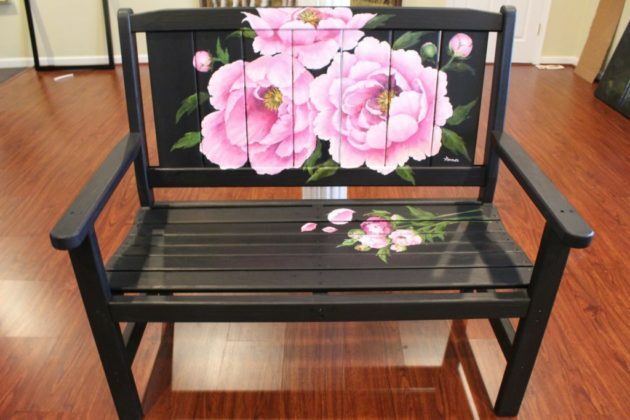 A live auction of the benches on Nov. 2 will raise money for the arts nonprofit’s programs. The New York School of Arts — formerly Open Art Studio — has a new home in Vienna at 320 Maple Ave E.
The school, founded ten years ago, is focused on individual-based education in art and design with faculty from programs like Brown and Columbia universities. The studio had previously been located at 225 Mill St NE. 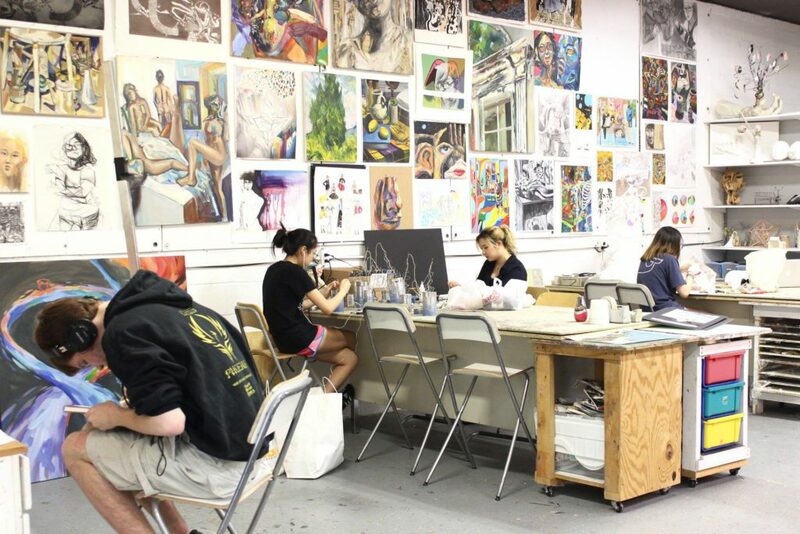 The school programs range from art programs for children to portfolio reviews for students applying to arts programs. Registration is currently open for the art foundation summer camp, aimed at students in grades 6 through 8. 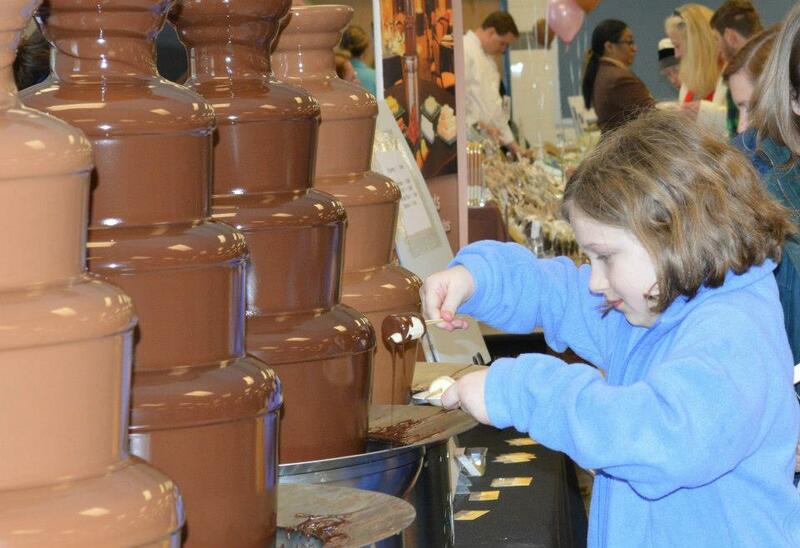 Classes range from $245 for children under two years old to $760 for older students. After three months of work, a bare wall behind the Vienna Shopping Center has been turned into a sweeping mural depicting the Tysons skyline and other prominent locations throughout the region. The project was led by artists Eleanor Doughty, a Vienna native who now lives in Seattle, and Emily Herr, who lives in Richmond. Students from the nearby James Madison High School also lent a hand over a weekend in November. The project was funded by Rappaport, owners of the shopping center at 180 Maple Avenue. The mural can be viewed at the end of Cottage Street. The mural is complete at Vienna Shopping Center, showcasing the DC Metro sites like the cityscapes of Arlington, DC, and Tysons. 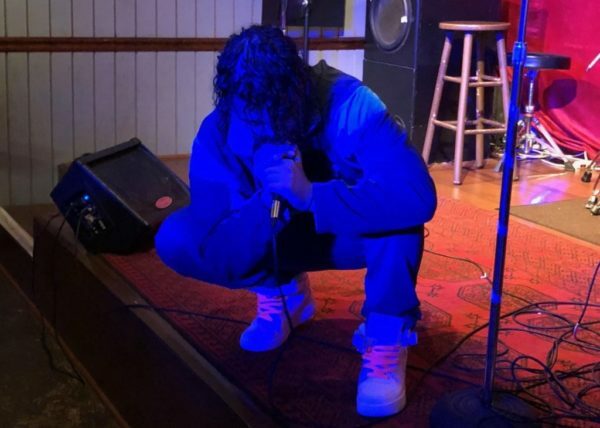 Tysons is far from the cultural wasteland it once was, but there are still challenges ahead as the area develops a creative arts scene. If Tysons truly hopes to become “America’s Next Great City,” it must become a cultural hub as well as a technological and financial one. 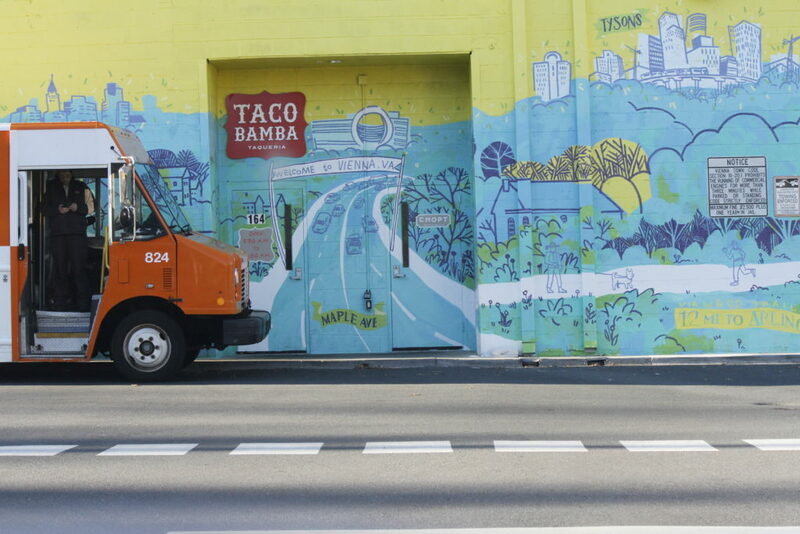 Urban planners across the country use arts districts to bring reinvestment to neighborhoods, and cultural amenities can be a powerful draw to the creative class. However, there are still many obstacles in the way of local artists. 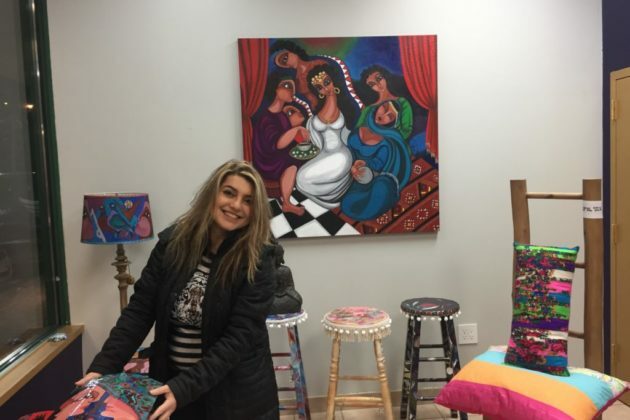 Arts in the area are served by public programs like the $500,000-a-year ARTSFAIRFAX grants, but ARTSFAIRFAX is a county-wide program and its budget is relatively modest for such a large jurisdiction. High property values can be a major obstacle to those who would rent studio or gallery space. 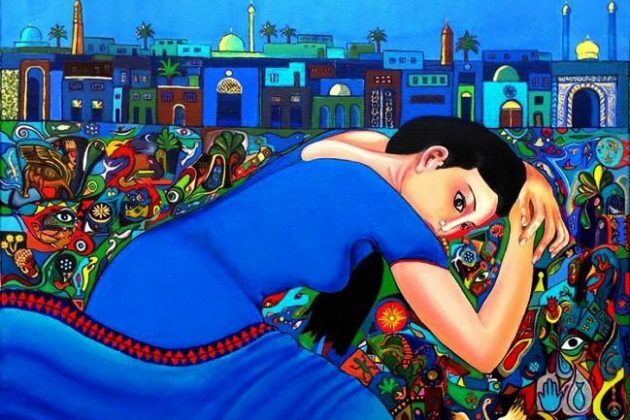 The Katibeh Art Center, which featured works by the Iranian artist Ebrahim Emad, recently closed. Emad told Tysons Reporter that he’d had to close the gallery in part because of difficulty physically advertising its presence, as he was unable to hang promotional signs — and because his location in a mid-rise office building offered very little pedestrian traffic. 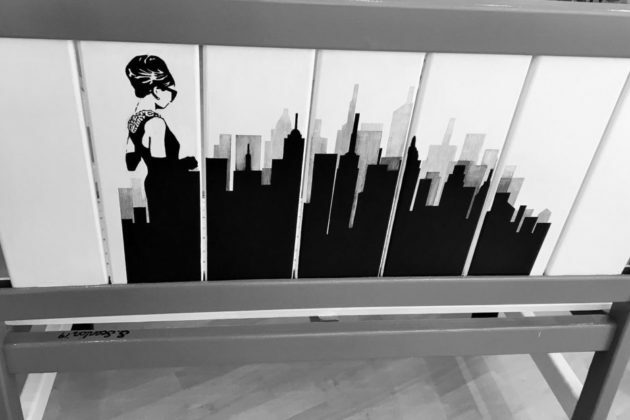 McLean Project for the Arts (1446 Chain Bridge Rd, McLean) — The McLean Project for the Arts hosts exhibitions, classes for all ages, and special events. The upcoming exhibition, Intention/Invention, will run from January 10 until March 2, with an opening reception on January 12 and an artist talk on January 26, featuring abstract works by two contemporary artists. The Project’s classes cover a wide range of media, and include many classes meant for adults with some artistic background as well as both classes and summer camps for children. MK Gallery (1952 Gallows Rd, Tysons) — This gallery, a Tysons establishment for over 15 years, primarily features artists of Korean nationality or heritage. 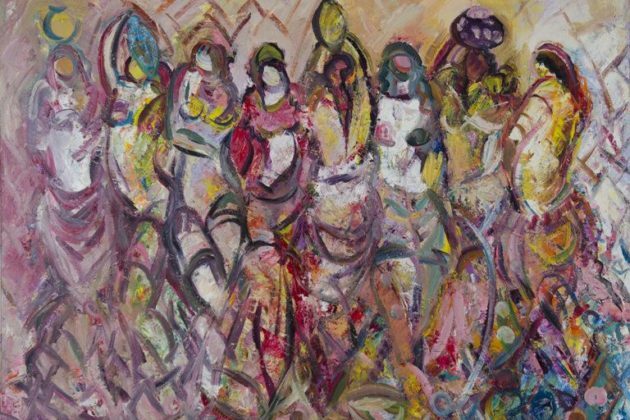 The current exhibition, on show until January 11, is a double, featuring two exciting artists. 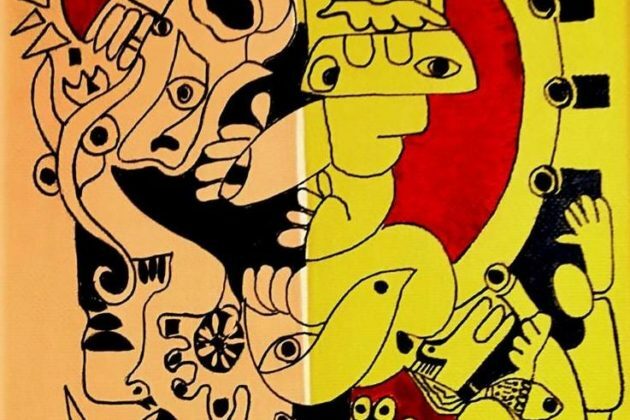 The first, B. G. Muhn, a professor of art at Georgetown, organized the first-ever exhibition of North Korean art in the United States. The other, Suh Yongsun, is based in Seoul and uses strong color to depict themes of modern social and political life. 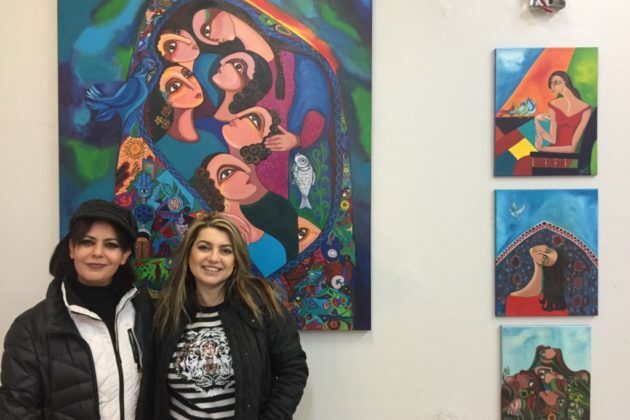 Dara Global Arts (7501 Leesburg Pike, Falls Church) — Dara is a small pop-up gallery focused on painters from Syria and other Levantine countries. 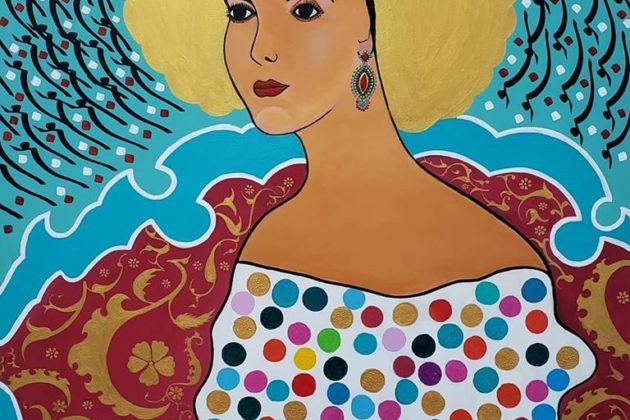 Featuring “a highly curated collection of original art that reflects the empowerment of artists and their freedom of expression,” it particularly features the work of women. 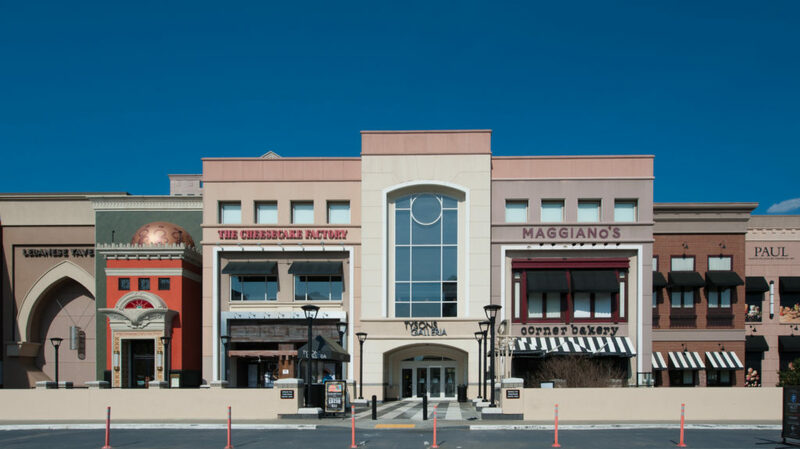 LIK Fine Art (Tysons Galleria, 2001 International Drive) — Peter Lik’s latest of seventeen luxury galleries offers large-format landscape photography. The Hermitage Gallery (6831 Tennyson Drive, McLean) — Offering both fine art framing and an exhibition gallery, the Hermitage represents a variety of local and international artists. YMM Art Space (8216 Old Courthouse Rd C, Vienna) — YMM is not a gallery, but rather a space of creation and education “dedicated to stimulating the imagination and enhancing the creativity of each and every student.” They “offer classes like fashion design, comics design and origami to students as young as 8, so kids have the opportunity to develop their interests in pretty specific areas,” and there are also classes for younger children and for adults. 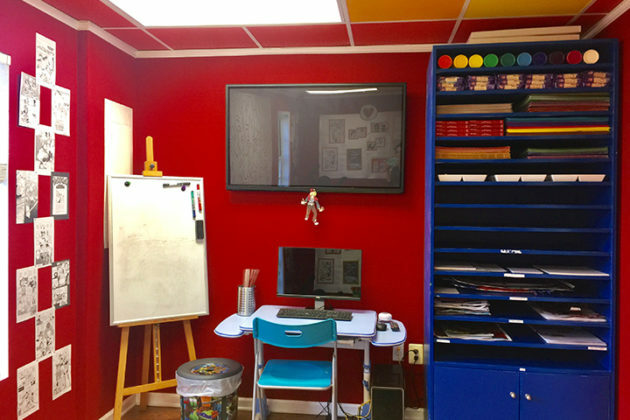 Tysons Art and Learning (8343 Greensboro Dr, Tysons) — This space offers a wide range of art courses for a variety of ages. Their courses extend to digital arts and to writing, and registration and schedules are flexible. 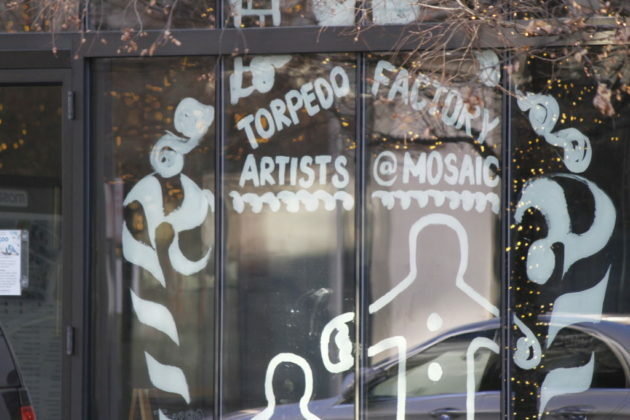 (Updated 2:30 p.m.) If you’re looking for a last minute holiday gift, the Torpedo Factory Artists’ Association’s location in the Mosaic District will be offering (relatively) affordable art until this coming Sunday, Dec. 23. The ≤500 exhibit features a range of art types with a focus on affordability, all items being priced at or below $500. 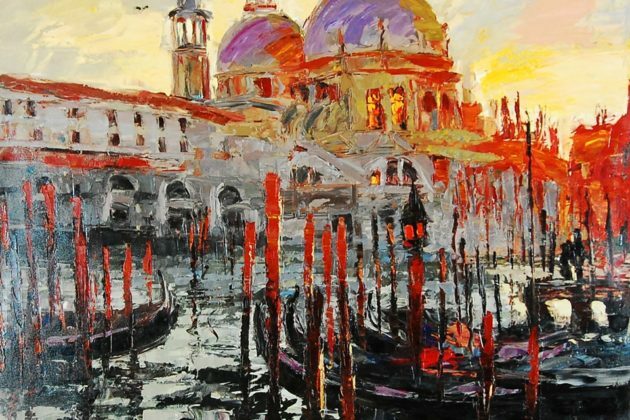 The artwork in the gallery includes painting, photography, and glass mosaics. The gallery is open Wednesday through Sunday from 11 a.m.-7 p.m.
After the ≤500 exhibit closes on Sunday, a new exhibit called “Voyages” will run from Dec. 26 through Jan. 27 and “MicroResidencies” from Jan. 30 through March 3. 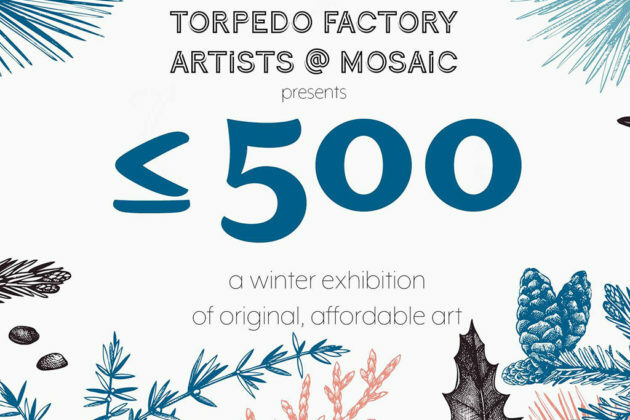 The Mosaic gallery is managed by the Torpedo Factory Artists’ Association. The Mosaic gallery opened at 105 District Ave in April this year, on a one-year lease, after a short run in November 2017 as a pop-up gallery. 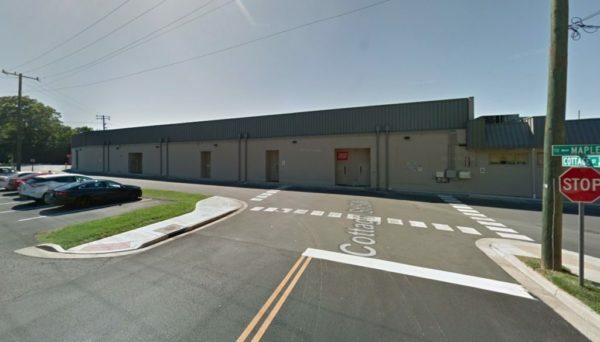 Something new and colorful and about 200 feet long is coming to Vienna: A mural will soon be created on the back wall of the Vienna Shopping Center, visible as you travel down Cottage Street. Artists Eleanor Doughty, a Vienna native who now lives in Seattle, and Emily Herr, who lives in Richmond, plan to start work on the mural, an overview of Town buildings and area landmarks, beginning November 5 and expect that the project will take up to two weeks, depending on weather, to complete. The town’s newest public art project is being funded by Rappaport, owners of the shopping center at 180 Maple Avenue.